AP Physics 2012 exams are just a few days away. Your final preparations for the exam must be in full swing and there is no time to waste. Today I give you a few multiple choice practice questions on atomic physics and quantum effects. Questions in this section posted earlier on this site (with solution) can be accessed by clicking on the label ‘atomic physics and quantum effects’ given below this post. Or, you may try a search for ‘atomic physics and quantum effects’ using the search box provided on this page. 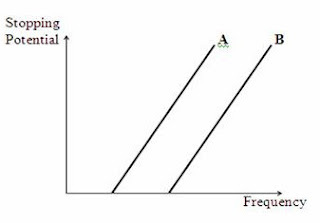 (1) The adjoining figure shows the graphical relation between the frequency of incident radiation and the magnitude of stopping potential in the case of metals A and B. Note that the straight line graphs have the same slope. Which one among the following statements is correct in this case? (c) Maximum kinetic energy of photoelectron in the case of metals A and B is directly proportional to the increment in frequency of incident radiation over the threshold frequency. (d) Metal B is a better photosensitive material than metal A. Since we have straight line graphs for both metals, maximum kinetic energy of photoelectron is directly proportional to the increment in frequency of incident radiation over the threshold frequency. Therefore option (c) is correct. The above relation shows that the kinetic energy becomes four times when the momentum is doubled. Therefore, the de Broglie wave length of a particle can be reduced to half its initial value by changing its momentum to twice the initial value. Evidently the kinetic energy of the particle the becomes four times the initial value [Option (d)]. A particle has de Broglie wave length λ when its kinetic energy is E. What additional kinetic energy is to be aded to it in order to reduce the de Broglie wave length to λ/2? The answer is 3E since you are asked to find the additional kinetic energy]. (3) Uranium (atomic number 92) has an isotope of mass number 235. It can undergo successive disintegrations to get transformed into lead (82Pb207). How many α-particles and β-particles are emitted during this transformation? Beta particle emission does not affect the mass number. In order to reduce the mass number by 28 (from 235 to 207), the number of α-particles to be emitte must be 7. Since each α-particles carries two fundamental units of positive charge, the atomic number of the end product gets reduced by 14. But the final product (82Pb207) has its atomic number reduced by 10 only. The extra 4 units must be obtained by the emission of four β-particles. The correct option therefore ia (a). [Note that when a β-particles (electron) is emitted from the nucleus, the nuclear charge increases by one unit. This happens as a result of the transformation of a neutron in the nucleus into a proton]. (4) Fundamental forces in nature are gravitational force, electromagnetic force, nuclear force and weak force. If these forces act over very short distances of the order of nuclear dimensions, how do you arrange them in decreasing order (starting with the strongest? [Don’t get carried away by the term ‘weak force’. The weakest force is gravitational force where as the strongest is nuclear force]. (5) Two protons are separated by a distance of 50 Ǻ. If the electromagnetic force between them is F1 and the nuclear force between them is F2, which one among the following is the most reliable statement? This question is similar to question No. (4) in the sense that it is meant for checking your knowledge of nuclear physics. The correct option is (a). Nuclear force is a very short range force. At a separation of 50 Ǻ which is very large compared to the size of a nucleus, nuclear force (strong interaction) between two protons is negligible compared to the electrostatic force. Therefore the correct option is (a).